Raise your voice. Advocate for opportunity. Cast your vote. Public policy is a powerful tool for change. Our state and our economy can be strengthened by advancing common-sense, practical solutions that create opportunities for women to reach their full potential and remove the barriers standing in the way of their progress. One bill can positively, or negatively, impact hundreds of thousands of women and families. That is why WFCO engages in public policy advocacy and why your civic engagement is crucial. Not sure where to start? You already have – you’re here. This page will help you find resources for voting, research ballot issues and candidates, learn about the legislative process, and engage in advocacy. Bottom line: Register to vote, read your Blue Book, find your polling place, and cast your ballot. Your Voice and Your Vote Matter! Register to vote and confirm or update your voter registration at www.GoVoteColorado.com or complete your voter registration form and mail it to your county clerk and recorder. Colorado law allows voter registration through election day, though when you register can impact how you receive your ballot. To register to vote, individuals must be 18 years old by election day (although individuals as young as 16 can register in preparation for their 18th birthday), citizens of the United States, and have lived in Colorado at least 22 days prior to election day. Visit the Colorado Secretary of State website for more information. Many Colorado communities will elect new local leaders. The mayoral races in Colorado Springs and Denver are already garnering a lot of attention. In addition to the United States presidential race, Colorado voters will decide who represents our state in the United States Congress. All of the seats in the U.S. House of Representatives as well as the Senate seat currently held by Senator Cory Gardner will be up for election. Colorado voters will also elect their state representatives in all 65 Colorado House of Representatives districts, elect their state senators in 16 of the 35 Colorado Senate districts, consider local races, and potentially vote on both statewide and local ballot measures. All Colorado voters (whose registration is completed at least 8 days in advance of an election) receive a mail-in ballot. Mailed ballots must be received (not postmarked) by your county clerk and recorder by 7:00 p.m. on election day. If you are unsure whether your ballot will be received in time, drop it off at a designated drop-off location until 7:00 p.m. on election day. Polling locations are also available for in-person voting. Visit your county clerk and recorder's website to find your polling place or ballot drop-off location. Visit the Colorado Secretary of State website for more information about mail-in ballots. Colorado voters often have the opportunity to weigh in on changes to the state constitution and state laws. These statewide initiatives end up on the ballot through referral by the Colorado General Assembly or are championed by proponents in the community and certified for the ballot through a complex process. An impartial analysis of each amendment, law, and question on the ballot is prepared by the Colorado Legislative Council staff with input from the community, including proponents and opponents. The analysis is presented in the Ballot Information Booklet or “Blue Book”, which is mailed to all voters and available online. The Brownstein Colorado Ballot Initiative Tracker, available through the law firm Brownstein Hyatt Farber Schreck, is a great resource for tracking all proposed statewide ballot measures and their progress through the certification process. Colorado news outlets often cover important or controversial ballot measures in their politics or op-ed sections. Check your favorite outlet's website to see what issues they're covering. WFCO cannot and does not take a position on any candidate for public, elected office. That's up to Colorado voters like you. There are many resources to learn more about the candidates on your ballot and where they stand on the issues. Two good places to start: The League of Women Voters' guide on how to judge a candidate provides a road map, including a template for a candidate report card, and Vote Smart provides unbiased information about candidates and elected officials. We also encourage you to visit candidates’ websites, contact them with questions and suggestions, and participate in community events to learn more about those who seek to represent you and govern your community. The Women’s Foundation of Colorado engages in public policy advocacy to influence the systems that impact all aspects of our communities, including through the legislative process. You can, too! The Colorado General Assembly is complex and largely operates in the same way as the United States Congress. We have a bicameral legislature, made up of the House of Representatives, which includes 65 seats, and the Senate, which includes 35 seats. Representatives serve two-year terms and are limited to four consecutive terms. Senators serve four-year terms and are limited to two consecutive terms. Learn about the Assembly's composition, procedure and powers, the state budget process, and more. Many ideas for new laws or changes to existing laws come from community members. Legislators value opportunities to listen to their constituents about challenges facing their communities and potential solutions for them. Legislators also want input from those they represent about the issues on which they vote throughout the legislative session. There are many ways to share your perspective with elected officials, as an individual or a representative of a community group, business, or organization. First, find your legislator. Then, you can contact them by phone, email, or mail. You may also request an in-person meeting with elected officials. Tell them you are a constituent; legislators pay attention to those who put – and keep – them in office. Communicate aspects important to you in your own words; legislators prefer not to receive standardized emails and/or calls. Including something specific to your district is helpful (a personal story, something you saw/heard, why this matter is especially important to you, etc.). Use this formula, pulled from an action alert for the Child Care Tax Credit (CCTC), for whatever bill or issue you're calling about. 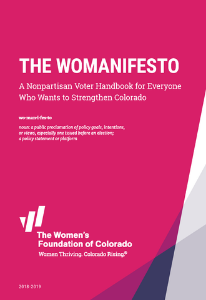 Introduction: Introduce yourself as a constituent and include your affiliation with The Women’s Foundation of Colorado, as well as your professional affiliation or role in the community. What issue you're calling about and why: Continuing the CCTC is important to us because it helps encourages contributions to child care resources throughout Colorado, which helps ensure women can work to support themselves and their families. Ask for support: Please support HB18-1004 by voting yes (if your senator will be voting) or by encouraging your peers to vote yes (if your senator will not be voting). Use this formula, pulled from an action alert for the Child Care Tax Credit (CCTC), for whatever bill or issue you're emailing about. Every bill introduced in the Colorado General Assembly receives a public hearing. The bills are first considered in the chamber in which they are introduced, assigned to a committee for a public hearing, and then, if passed out of committee, return for further consideration by the chamber in which the bill was introduced. Then, if the bill passes the first chamber, the process is repeated in the second chamber. If passed by both chambers, the bill advances for the Governor’s approval. Learn more about proposed legislation through the Colorado General Assembly bill tracking tools. Sign up for our eNewsletter and follow us on social media to stay up-to-date on what's happening at the Capitol and to receive action alerts to contact your representatives on critical issues impacting Colorado women and their families. Each spring during the legislative session, WFCO hosts a lobby day at the Capitol for community members to learn about and participate in the legislative process. Sign up for our eNewsletter to be the first to know when registration opens.